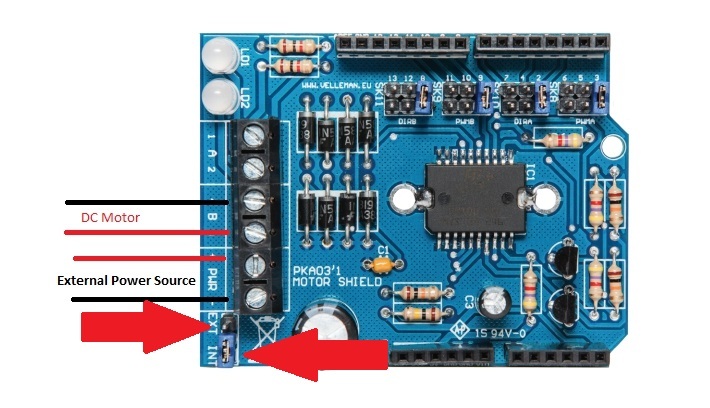 I want to control two dc motors with a VMA03 and an arduino. You need to move the jumper. Perfect, will try it after the holidays. Thank you for your advice, it has worked. but I run into another problem, which is the motor only works in one direction even though it’s a bidirectional motor. This problem only occurs when I attach the motor to motor B slot. It’s good that you sent a link to the motor. The max current output the VMA03 can provide is 2.5 amps. The current draw of the motor is 6 amps. You may have damaged the B channel. Thank you, It appears that you are right, as I tried it on another VMA03 controller and it worked. 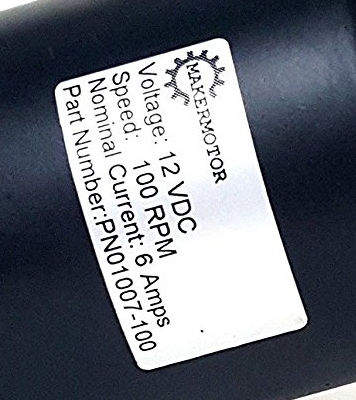 One last question, do you think it is possible to use two VMA03 motor controllers to supplied higher current to the motor, if so how do you suggest I do it. Sorry if the questions seem too basic, as I just started learning. The question is not to basic. Just my opinion but this could cause an issue. 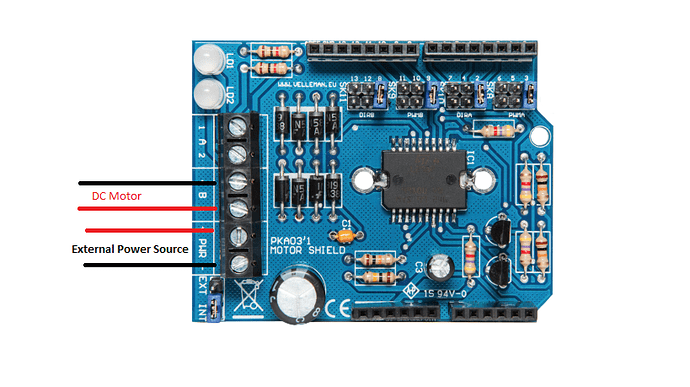 On two Arduinos if you are using a PWM while one pulse is going up the other may be going down and cancel each other out. If you are asking about stacking them in them on top of each other I really don’t know. I haven’t tried that. Yes I mean stacking them on top of each other and connecting the output of the two channels to the same dc motor. Theoretically I think it should be possible but I’m not sure. I would have to check into it but I think the max current the outputs of the Arduino can provide is 40mA I don’t know how much current each pin of the VMA03 requires. 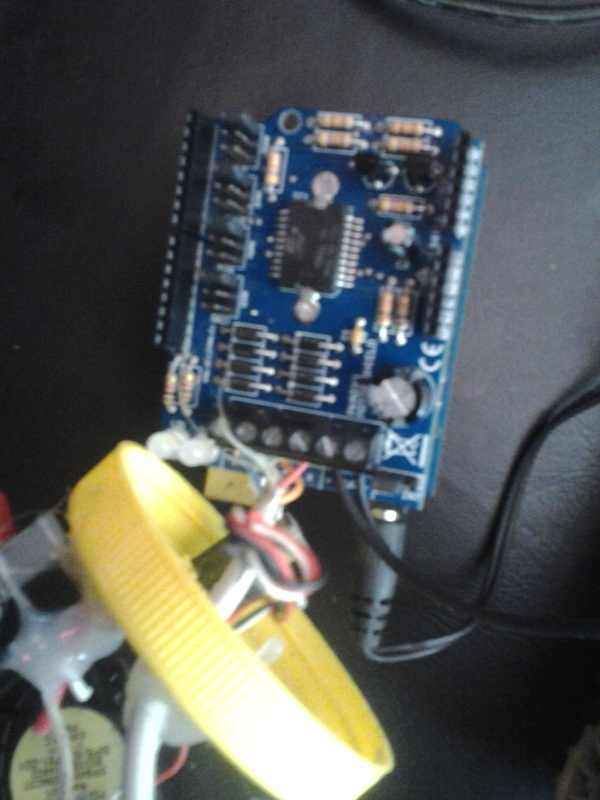 I have been playing with the Arduinos a lot but will admit I don’t know everything there is to know. You may want to look at the VMA411 however if you go over 1 amp you will need a heat sink to go up to 5 amp. 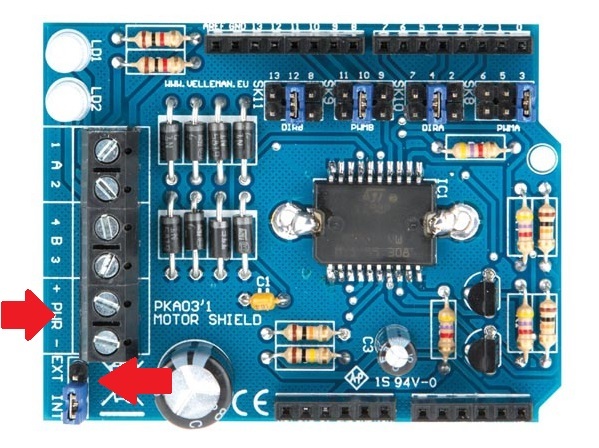 I am an beginner and 1 want to drive 2 dc motors with this shield and a 7V 1500mah and i have the same problem. I tried your solution but it did not worked for me the arduino went fully silent . Wen i put the pin back to INT it goes back to driving the motor from the uno board. Ps please mind my english i am Surinamese. When you set the pins on EXT are your putting power into the VMA03? 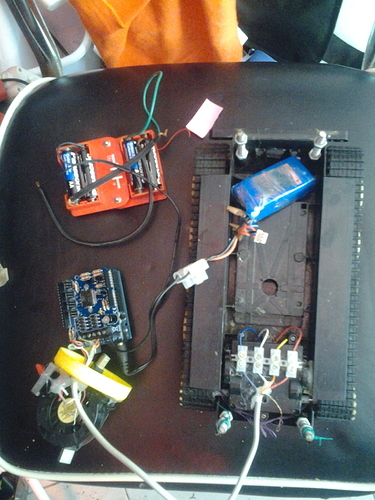 Yes I have a 7.4 V battery pack connected to the shield, the uno is hooked up to 6v AA batteries , so when the pin is set to int the motors respond but weak when i put it to ext it goes fully silent incl the uno board. From your picture I tell what’s going on. You should check the polarity for both units from the batteries. Also check the current draw of your motor it maybe more then the batteries can handle.